My last post explained how, in January 2012, I conducted a survey on Roman emperors in Leeds city centre with the help of my students. A year later, in January 2013, I gave a public talk on what we found out from the survey as part of the monthly Classics in our Lunchtimes series at Leeds City Museum. This post covers a few of the main findings. We would like to find out which Roman emperors people are most familiar with. If I ask you to name a Roman emperor, what is the first name that comes to mind? Above all, of course, we wanted to find out people’s views on Augustus. But we deliberately didn’t mention him at the start of the survey, in order not to influence people’s answers. Our aim was to find out who was really at the forefront of people’s minds – to know what they would say spontaneously when asked to think of Roman emperor. The results were fascinating. 20% of people said they couldn’t think of an answer, and another 5% gave names such as Zeus, Napoleon or Hercules – none of whom were ever emperors of Rome! But that means 75% of the people whom we bounced up to in the streets of Leeds were able to answer our question and name a famous Roman – and I think this says a lot about the profile and importance of Roman history in 21st-century Britain. A famous cliché has it that if you ask someone to name a famous Belgian, they can never think of an answer (although of course there are plenty of good answers in reality). Our survey found that the ancient Romans are in a happier position. In fact, the most popular answer by far was ‘Julius Caesar’, clocking in at nearly 50%. But most Roman historians would say that this isn’t really an accurate answer to our question either, since we had asked people to name a Roman emperor, and Julius Caesar was not an emperor. He held absolute power over the Roman empire for a short time as a dictator, but in his day this was an emergency office, only intended to be held temporarily. The regular political system was still government by elected magistrates, so there was no accepted role of emperor for him to hold – and his contemporaries soon expressed their displeasure at his attempt to create one by assassinating him. In a way, Caesar’s popularity in our survey is rather sad for Augustus. A generation after Caesar, Augustus (at that time called Octavian) was the person who did succeed in creating a stable system of rule by emperor, and in persuading the people around him to accept it as a long-term political solution. It says a lot about how low his public profile currently is that in spite of that achievement, when the people of Leeds are asked to name a Roman emperor, they don’t think of the man who invented the entire system of rule by emperor in Rome. They think of Julius Caesar instead. Our findings also helped to show why that was, though. 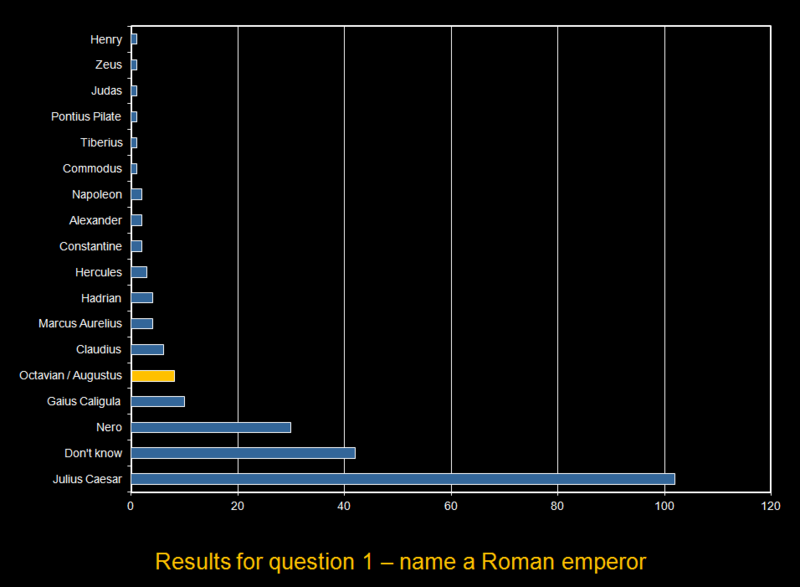 The answers to question 1 generated a sort of ‘Roman emperors top ten’, showing which of them stood highest in the local public consciousness and which of those were better known than others. The ordering in which they occur on this list actually matches up pretty closely with how often they appear in films and on television, and whether they are shown as strong central characters or secondary players in the stories of others. Later questions also uncovered that although the most common source which people gave for their knowledge about Augustus was ‘school’, the second most common was ‘TV’ – a clear sign of how important this medium is for people’s engagement with the ancient world. If you would like to listen to the whole talk, a full audio recording complete with my Powerpoint slides are available now on the Classics Talks at Leeds blog. There, I say a little bit more about how both Julius Caesar and Augustus are portrayed on screen, and the relationship between the qualities which Augustus wanted to be remembered for and how the people of Leeds actually see him. I also answer a few audience questions on how Augustus has been seen in different historical contexts since his death at the end. Eventually, the full results from both this survey and a second survey conducted after 2014 will be published as one of the outcomes of my current research into Augustus’ bimillennium. But until then, I hope this little taster shows something of the interesting insights which an afternoon’s work on the streets of Leeds can reveal.